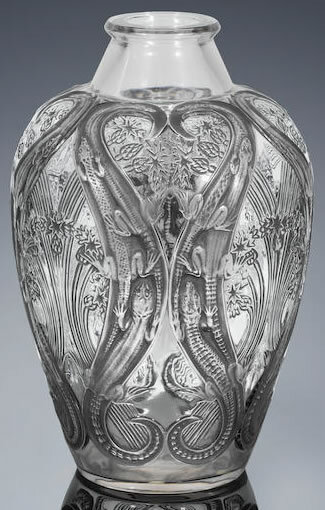 Rene Lalique Vase Lezards Et Bluets: 33.5 cm tall clear and frosted gray patinated lizards and cornflowers motif mold-blown shouldered glass R. Lalique Vase Lot No. 203 Est: £6000 - £8000. Model: 879 Circa 1913. Note: There are over 200 R. Lalique lots in this single owner collection sale, with an emphasis on early and rare vases, car mascots, seals, and paperweights. In addition there are high quality examples across many other areas of the collecting field including cire perdue, decanters, ashtrays, glasses, decorations, boxes, and perfume bottles. You can read our take on the sale in this article: Fabulous Well Curated Collection Comes To Auction!